L'abbazia di San Cassiano a Montescalari or Abbey (Badia) of Montescalari is located in the Chianti hills at about 700 m altitude in the frazione of Ponte agli Stolli in the county of Figline and Incisa Valdarno, near the border with the county of Greve in Chianti. 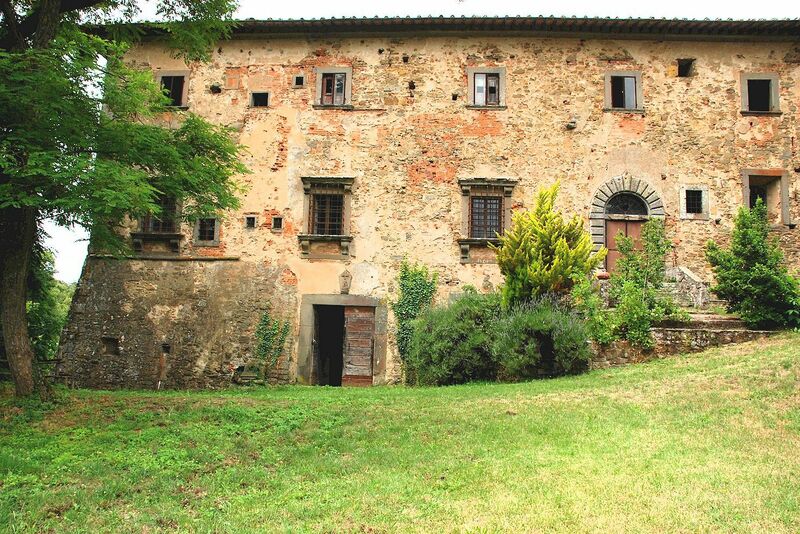 It is situated in the woods of Monte Scalari, between the valley of the River Arno and the valley of the River Greve, in a remote area somewhat difficult to access using an ordinary car. The origins of this Abbey are to be found in a hospice for pilgrims that existed here near the ancient Via Cassia Adrianea. Around the year 1040, it is documented that a monastic community here received a donation from the lords of the Castle of Cintoia and shortly after that this early religious settlement embraced the Vallombrosan reforms originating from Giovanni Gualberto of the Visdomini family, lords of Petroio in Val di Pesa. Thanks to continuous and generous donations, by the early 13 C, the ancient hospice had been transformed into a real abbey. In front of the church is an inscribed stone embedded in the wall that informs us that on 26 May, 1212, the church itself was consecrated by Ranieri, a famous Bishop of Fiesole. The wealth of the abbey is confirmed by the high taxes that the monks had to pay between the 13 C and the 14 C. They were in fact taxed for almost 32 lire and 10 soldi, a lot of money in those times. At first the abbey consisted of church and oratory, a few rooms for the monks and a small hospice for pilgrims. Then it was enlarged and the church was consecrated on 26 May 1212. The bell tower was built in the 13 C and 14 C, and consisted of a beautiful tower without openings until the belfry itself which was opened by mullioned windows on each side. This was the only part of the monastery never to have been tampered with but was destroyed on 20 July, 1944 during the German retreat and today only the base of the tower remains. Between 1611 and 1613, the Abbey of Montescalari was expanded with the construction of the cellars, rooms for the Abbot, the Chapterhouse of the sacristy and all the cells for the monks. 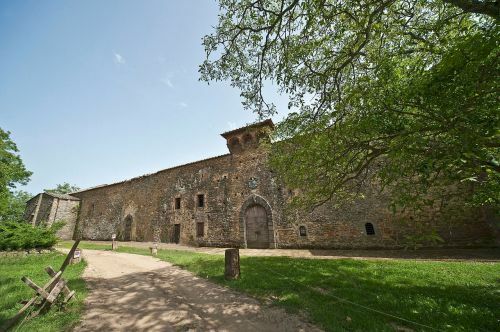 Work began on 27 December, 1611 and with these additions, the abbey assumed the character of a Tuscan villa, with plastered walls, sandstone frames for windows and doors, windows with sills supported by shelves. An upper gallery was also created, with pietra serena columns resting on a stone ledge. This stonework was carried out by the stonemason Bartolomeo di Berto da San Donato. From 1830 to 1980, the abbey was owned by the Rosselli Del Turco family. Today the abbey resembles a large quadrangle to which various parts of the building were successively added, including the abbey church and cloister situated in the center of the complex. The main entrance is topped by a "turret", with round arched brackets, supported by stone corbels. 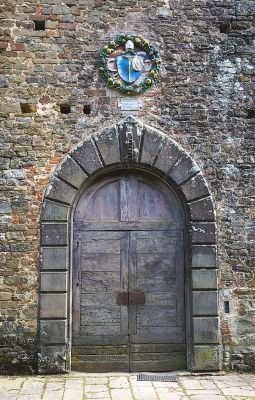 The two portals have rusticated frames in sandstone, the main one has the arch that ends with a small spire, while that to the East has the arch decorated with the Medici coat of arms. The floor plan of the church is a Latin cross, with a single hall and gabled roof. Originally it was terminated by a semicircular apse, but this was later replaced by the current four-sided apse. The refectory of the abbey has a beamed ceiling and the wine cellars underneath are in turn supported by pillars. In the church there are several stone altars. 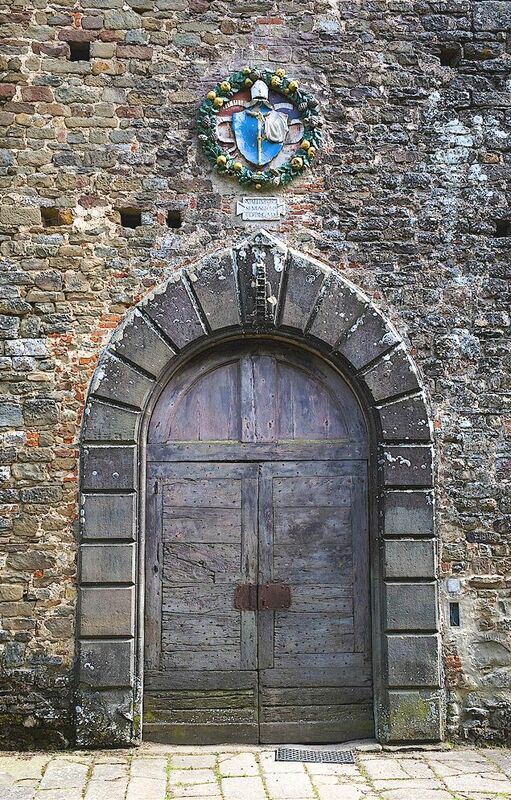 An abbey bell, in 1295, was moved to the church of La Panca, while the other, destroyed in 1815, was created by Andrea del Verrocchio with figures and reliefs, and later purchased by the parish priest the Church of San Pancrazio in Valdarno where in 1815 it broke and was melted down. The remaining artistic heritage remained the spacecraft and the censer embossed copper and gold, which are currently in the parish church of San Donato a Mugnana in Chiocchio. The censer is known as a censer of St. John Gualberto, it has a shape of pinnacles and in the brazier are depicted St. Peter, St. Paul, a Bishop Saint and the Virgin. In the corners there are angelic figures in relief. The lid is decorated with plants and cherubs' heads. The ship is decorated with bunches of grapes and ears of corn. On the cover is the image of San Giovanni Gualberto. They are dated between the late 16 C and early 17 C.
In the abbey there remains part of a fresco of the Crucifixion, in which you only see the feet of Christ and the base of the Cross. This was painted by Bernardo di Stefano Rosselli. Other paintings are 'the Samaritan woman at the well' and an 'Ecce Homo', of which the artist is known to be the painter Nicodemo Ferrucci, thanks to a discovery of documents in the Archives of the State of 1611. On the portal of the abbey facade there is the coat of arms in glazed terracotta with the insignia of the abbey, executed in 1505 by Luca Della Robbia the Younger. After the damage suffered during World War II, a restoration campaign was undertaken that led to the elimination of various additions and retrieved the original masonry filaretto. La Panca in Chianti © ammonet InfoTech 2016 - 2019. All rights reserved.